FatCow - Does It Live Up To The Hype? What else will you get with The Original FatCow Plan? Talk about feature-packed! FatCow has an impressive tierless shared hosting plan that could go head-to-head with DreamHost’s offering. But this web host trumps DreamHost’s all-in-one shared hosting in terms of cost factor. The Original FatCow Plan is more than $50 cheaper than DreamHost’s shared hosting plan, based on the annual rate. DreamHost, however, offers a free domain name for life. FatCow may give you your first domain for free, but this offer is only available on your first term. After that, you’ll have to pay at the regular price. So if a free domain name is a big deal to you, then you might want to consider DreamHost instead. 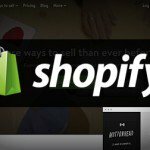 FatCow has recently introduced a monthly payment plan for their shared hosting. 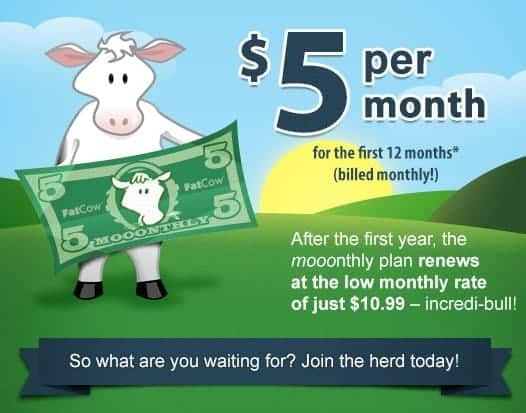 If you sign up today, you can opt for their Original FatCow Plan for only $5 per month. It’s a special introductory price that applies to the first 12 months of service for the shared hosting plan. After that, the plan renews at $10.99 per month. That’s 60% off if you register an account right now! Pretty good deal, right? If you’ve outgrown your shared server and your site needs more room to grow, then it’s time to go for a higher hosting package. This is where choosing between different plans make sense. Just last year, FatCow started offering VPS and dedicated hosting plans which cater to those who wish to upgrade their host. If you want more control, access to semi-private resources and cloud-based flexibility (but you don’t want to pay for a costly dedicated server), then FatCow’s VPS hosting plan is your answer. It’s instantly deployable and you can further expand your website’s functionality! FatCow has three VPS hosting plans: Basic, Business, and Optimum. The price starts at just $19.99 per month (20% off from the regular price of $24.99) to $79.99 per month, depending on the plan you choose. Just like their shared hosting plan, this limited-time promo is available only for the first term of services. Afterwards, you’ll have to renew at the regular price. What’s more, you’ll also have your very own cPanel, which is the best and most user-friendly control panel for creating and managing websites. FatCow is a close contender against web hosting champion, Arvixe. In fact, FatCow is a few pennies cheaper than Arvixe’s VPS hosting plans! Additionally, they offer larger storage and bandwidth. So if you’re looking for a good VPS package at an affordable rate, FatCow is a better option. Are you expecting high traffic volumes to your site? Shared hosting just won’t do! If you need the highest level of speed, reliability and security for your website, then it’s time to upgrade your host and have your very own server with FatCow’s dedicated hosting plan. That’s right, FatCow now have dedicated servers that cater to large-scale businesses and companies looking to expand their site without limits! You can choose from three dedicated hosting plans: Startup, Professional, and Enterprise. The first tier, Startup, is ideal for medium-sized businesses that are expanding quickly and are in need of extra power and security to accommodate growth. It’s an ideal choice for eCommerce sites that may have already outgrown shared or VPS hosting and don’t want their sites to experience any disruption caused by other site owners on their server. Meanwhile, the Professional plan is tailored for established businesses that are set to take their web presence to a whole new level by taking advantage of all the resources that come with a dedicated server, and using them to expand their site’s functionalities. For large companies and thriving businesses with high traffic volumes, frequent data transactions, and extensive site functionalities, the Enterprise plan is the best option there is. Expect the best possible performance and response times that could pave the way to your business’ online success! Just like their shared hosting plan, FatCow is now offering a limited-time 20% discount on all their dedicated hosting plans, starting at $119.99 per month to $191.99 per month! So you better hurry before the sale ends! Independent control. You can install applications without restrictions through the easy-to-use cPanel control panel. You’ll also have optional root access, plus fully managed support in case you need help. Dedicated resources. You’ll get the fastest operating speeds for your high-traffic website, and the highest level of security for advanced protection of all your data. And since you won’t be sharing your server with other users, your site will be at optimum performance – completely unaffected by other sites! Cloud-based flexibility. The sky is the limit – no pun intended! You have plenty of room to grow and scale your website – and your business – as demands increase. FatCow’s dedicated hosting plans may not be as flexible as Arvixe’s plans, but they certainly are cheaper by a few bucks. Arvixe, on the other hand, lets you customize your plan based on the amount of storage, bandwidth, and memory (RAM) your site(s) needs. But take note, the more you customize your plan, the higher the price you’ll pay! Unfortunately, FatCow only has Linux-based servers, which is the most widely used operating system (OS) in web hosting. This is bad news for those who are looking to host their site on Microsoft’s operating system (Windows) and on ASP.NET. In this case, you should look for a web hosting provider that’s both Linux- and Windows-friendly, like Arvixe and DreamHost. WordPress is no doubt the most powerful and widely used blogging platform and content management system (CMS) out there. I mean, who doesn’t love WordPress? You can use it for free, plus there are millions of amazing themes and plugins to choose from! But the thing is, WordPress is quite taxing on SQL servers. If you run it on, say, a shared hosting account, chances are your site will always crash during traffic spikes. Last year, however, FatCow introduced two different plans for managed WordPress hosting. They used to only have one hosting plan, with everything unlimited (but with so-so performance). Curated themes. FatCow have carefully selected the best WordPress themes to give your site a unique look and feel. Pre-installed WordPress plugins. From the performance-boosting W3 Total Cache to the all-inclusive social powerhouse Jetpack, you’ll have the coolest extras to further expand your site’s capabilities. Fully customized control panel. With managed WordPress hosting, you’ll get a custom control panel that’s especially designed for convenience. With it, you have instant access to all the WordPress tools you use the most. If you compare it to the Original FatCow Plan, there’s not much addition with the WP Starter plan in terms of features and performance. They just threw in a couple of extras. If you really want the good stuff and wouldn’t mind paying an extra couple of bucks, then you should go for their WP Essential plan. The WP Essential plan provides better speed for your WordPress-based site. With an SSD-based infrastructure and reconfigured servers, this managed WordPress hosting is tailored for maximized website uptime. FatCow have also teamed up with industry experts to provide a deluxe security suite (via SiteLock) that adds an extra layer of protection for your site by eliminating malware and keeping hackers at bay. And if you have any questions regarding WordPress hosting, rest assured that you’ll get prompt, knowledgeable response via personalized support. I would say that this is the right plan for more advanced WordPress users. 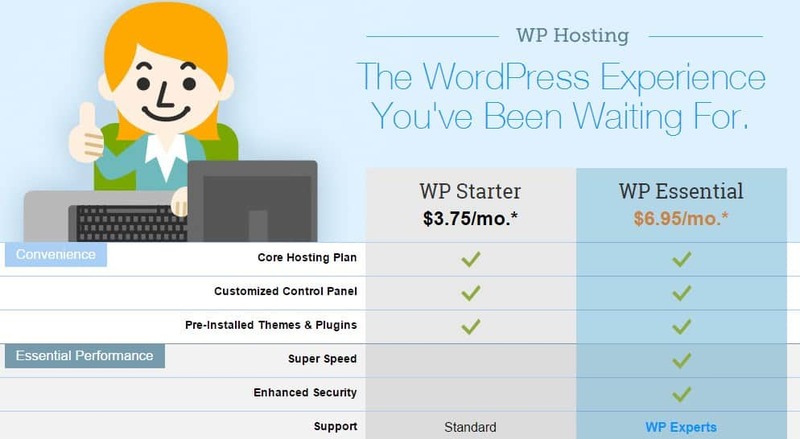 Don’t want to pay for managed WordPress hosting? 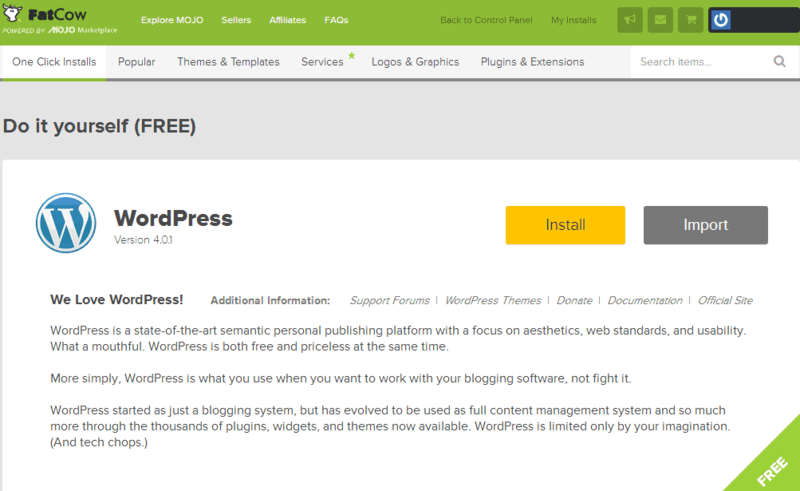 Don’t worry because FatCow still lets you install WordPress with their easy, one-click WordPress installation. You can do so from the main menu of the control panel. You don’t even need to give any information before you can set up your WordPress site with FatCow – unless you want to! For advanced options, you must specify the username, password, and title. As mentioned earlier, FatCow have built in a custom control panel for easy website creation and administration. You’re not likely to be blown away by the experience if you’ve already tried your hands on cPanel before, but FatCow have done away with the unnecessary tools and options – leaving a straightforward and more user-friendly version of cPanel. From the control panel, you’ll see plenty of advanced features and tools that appeal to both beginners and experienced users. They have even integrated Google Custom Search, which allows you to search within your site. You also have access to Webmaster Tools which provide you with the necessary tools to efficiently manage your site. For those who are new to cPanel, FatCow have included a video tutorial to walk you through the process of using the control panel. You don’t even have to pay extra fees to access this video. So if you’re still unsure about the cPanel, you can check it out first! 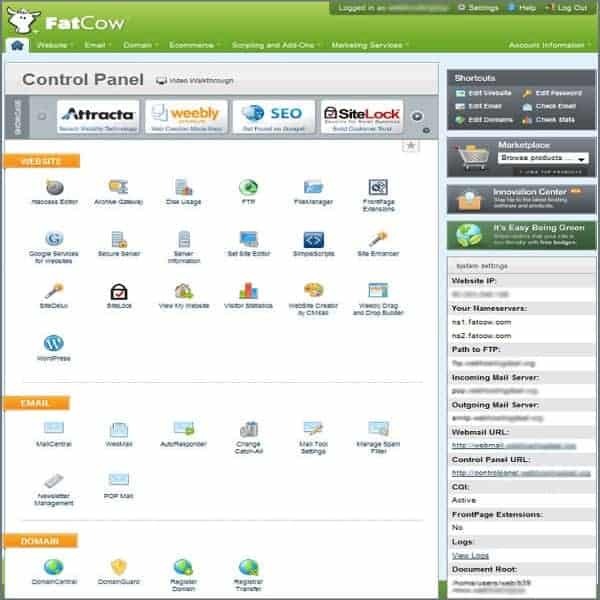 The great thing about FatCow is that you don’t have to pay huge amounts of cash on upgrades to be able to build a powerful and dynamic eCommerce site. Everything you need is included in their hosting package, which in my opinion justifies the slightly costlier initial investment compared to other leading web hosts. Shopping carts, payment gateways, and SSL certificates are all included in their hosting plan. And if you’re new to the eCommerce scene, FatCow will guide you every step of the way, thanks to their quick and easy-to-follow walkthroughs. 1-click installer for scripts, applications, and CMS solutions i.e. WordPress, Drupal, Joomla, etc. With so many extras thrown in for free, FatCow’s shared hosting plan alone could represent excellent value for money! 99.99% Uptime Guarantee – True or False? FatCow doesn’t really provide an uptime guarantee, so they never bother to publish statistics regarding uptime and response times. But that doesn’t mean they’re not doing their job to keep maximum uptime. In fact, FatCow have system management tools and engineers who are working 24/7 to ensure that their data center is always in tip-top shape. What’s more, their data center has a clustered architecture on all of its servers so if one server goes down, another one will take over right away. They also perform regular backups to minimize the risk of data loss on client sites. While no web host can assure 100% uptime (even Amazon goes down from time to time), you can expect high uptime and responsiveness with FatCow. They’ve recently upgraded their hardware and the result is a solid 99.77% uptime. But compared to the industry standard, this is a tad bit lower so they have some catching up to do. My site loads quickly, fast enough for me to say that FatCow have really put some serious thought into optimizing server speeds. Bottom line is that you’d still be able to serve your customers and site visitors with consistent performance across the board. 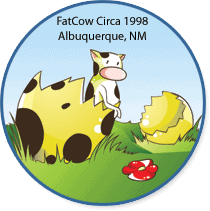 FatCow lets you try their service without any risk. They provide an industry-standard 30-day refund policy for those who wish to cancel their hosting account. This means that, in the event that they don’t meet all of your needs, you can simply cancel your hosting plan within the first 30 days and FatCow will give you your money back in full – no questions asked. The 30-day money-back guarantee, however, is only applicable to credit card payments. At the time of writing, FatCow does not offer the guarantee for other payment methods, mainly because of the costs associated with processing payments made by other methods. 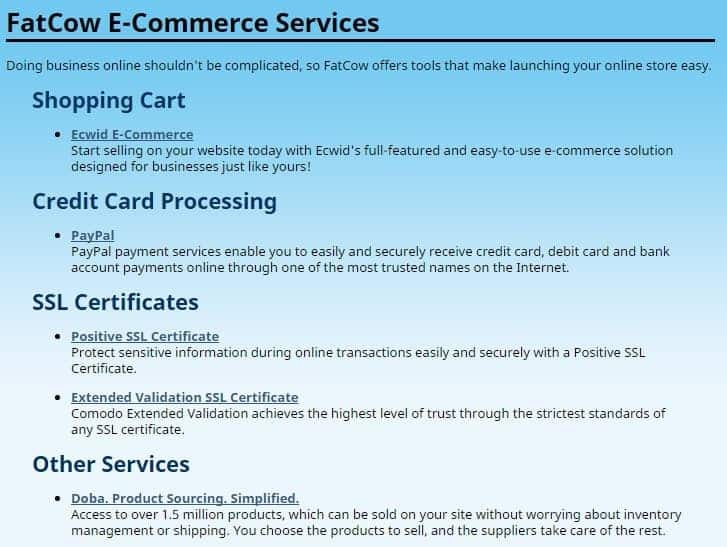 Additionally, it does not apply to most of FatCow’s add-on services, including domains. Take note that a $35 early cancellation fee will be applied to those who decide to cancel their account after the 30-day trial. This is a bit of a letdown compared to other web hosts that offer a prorated refund / anytime money-back guarantee, such as BlueHost and Just Host. Okay, so maybe this is the part that FatCow needs to improve on. It’s always nice to have a knowledgeable customer support staff that you can rely on in the event of a technical problem. This web host have put an emphasis on customer service, which is why they’ve employed a team called The Moo Crew. I found their customer support team to be average when I contacted them via phone and live chat. It took them an average of 10 minutes to respond to my inquiry, which is far from the worst wait time I’ve experienced. However, anything more than 5 minutes is, for me, not so impressive. On the plus side, FatCow has a comprehensive knowledgebase that’s filled with helpful tutorials. You can also provide feedback right on their Help page. With FatCow, an old-fashioned service and value still ring true. The cow puns aside, it’s a pretty impressive web hosting provider that prides itself on sheer simplicity. It may not be everyone’s top choice but it strives to be the alternative to the often technical and overwhelming world of web hosting. And in order to meet the needs of potential clients, they’ve even transitioned from only having annual hosting plans to more user-friendly monthly payment options. Whether or not this web host is right for you will depend on the kind of hosting you need for your site, the type and size of your business, and just how skilled and experienced you are in website-building. The slightly poor customer support aside, FatCow does provide the necessary tools that you would need to build one or more sites, without you digging deeper into your pocket. I highly respect this web hosting provider and I’m sure you’ll also enjoy working with them for years to come (just as much as I do). Affordable Hosting Provider. Does It Live Up To The Hype?